I have to start out with some clapping this afternoon so this will a pretty lengthy post, but keep reading it will be pretty interesting. Sandra from Stamper on the Shore sent me a really nice award today. 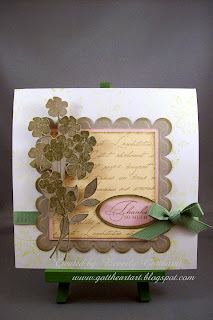 Coincidentally I was making this card for the Stampin' Royalty challenge which she is part of. So, I'm dedicating this card to Sandra. She has been one of my most loyal followers and always leaves me encouraging comments and she has provided me with some tips that have improved my blog. 3. List 3 things which you love about yourself. 5. Tag 5 people you wish to pass this award on to. I've done the first 2, now on to the rest of the list. 3 Things I love about myself: I always strive to be a positive person and look on the bright side of life. I love my family and try to give them top priority. This is one of my most favorite pictures of all time. 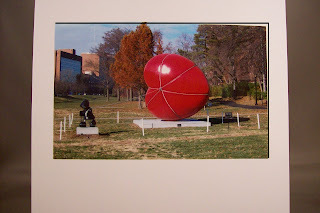 My husband and Mother saw an article in the newspaper about this art exhibit in Kansas City, Mo. A famous UK artist, MacKenzie Thorpe, created this 12 ft. heart along with some more of his sculptures were displayed in this beautiful park. This was in Nov., 2006 and they were determined that I get to see it in person(I'm a heart collector). This was the last big trip my Mom and I took together and combined it with a visit to her sister in Louisiana for Thanksgiving. I made this the wall paper on my computer and everytime my Mom comes in the office she says,"That was the greatest trip, wasn't it?" wonderful comments she leaves for me. challenges that are new to me, she's on several Design Teams, check her out if you get a chance. style, she's the one who has encouraged me to sew on my cards. positive encouragement for a friend. Supplies: 5 1/2" Square White card blank, Papers: Stampin Up-Sahara Sand, Blush Blossom, Barely Banana, Whisper White, Stamps: Stampin Up-Best Blossoms, Watercolor Trio, Stem Silhouettes, Stampabilities-LeLondon Script, Ink: Stampin Up-Kiwi Kiss, CTMH-Z2118 Desert Sand, CTMH marker-desert sand, Spellbinders Nestabilities-Classic Scallop Squares Lg., Stampin Up-Med Oval punch, ribbon-Offray, pop dots. Beverly, your card is just so impressive. I really love how you put this together. Excellent work. Forgot to say.... love both the cards, brilliant as always. Oh imagine my surprise when I went to check out your blog and found such a nice post. I've never had a post dedicated to me before. I also love your card. Thanks for doing my sketch such justice. Clearly this wa a superb card as you won at both challenges - congrats!